The opiate addiction issue is no longer someone else’s issue. This past July Vermont Public Radio came out with a survey, conducted by the Castleton Polling Institute, that had a broad spectrum of questions related to issues in Vermont. Opiate addiction was, of course, on that list. 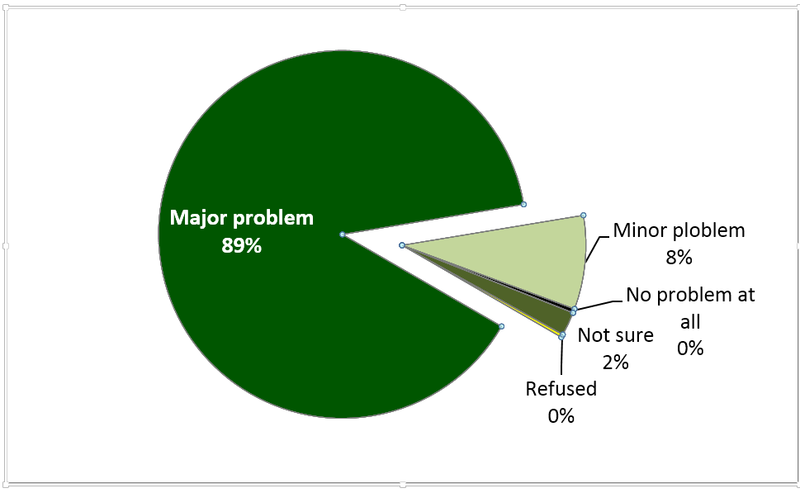 Eighty-nine percent of respondents in the poll said that opiate addiction is a “major problem” in Vermont. No one responded that opiate addiction was not a problem for our state. Opiate addiction in such a small state came as a shock to many, and was even featured in Rolling Stone magazine alongside an image of a Vermonter doing heroin on a maple syrup bottle. This past 2016 State of the State address focused largely on the opiate epidemic. Governor Shumlin spoke about daily drug related violence, and uncared for children due to drug addicted parents. He then discussed his plans to further battle the Vermont opiate addiction. When respondents were asked if they or someone they know have been personally affected by opiate addiction, the state was almost evenly split, with those responding “yes” (53 percent) in a slim majority. Of those who said yes, to knowing someone affected by opiate addiction, 94 percent said that they “personally” know someone who has struggled with opiate addiction. This shows that this issue reaches much farther than just the respondents. Despite the high numbers of those who know someone struggling with addiction there is a light that is shining over the sad news. Groups throughout the state are working throughout communities to decrease the use of opiates, as well as other drugs. In Rutland County there is an organization called Project Vision. Project Vision is a leading example of organizations that are getting the community actively involved to fight drug addiction and build the community. It also has local law enforcement actively involved, which creates a positive relationship between them and the communities they serve. Although opiate addiction is an issue it is definitely being fought by different groups of people throughout Vermont. Figure 1. Support for resettling refugees in your community, by Party. In a recent Vermont Public Radio poll conducted by the Castleton Polling Institute, 54 percent of Republicans (a slim majority) said that they would oppose an effort to resettle refugees in their community, whereas nearly 80 percent of Democrats voiced support for the resettling of refugees in their community. Consistent with the partisan split in the level of support, only 20 percent of Democrats, contrasted with 60 percent of Republicans, felt as though refugee resettlement would have a negative impact on Vermont. Independents were split in their opinions, with just over 33 percent believing resettlement to have a positive impact and just under 36 percent believing it to have a negative impact. Of the 637 complete interviews only 8 respondents cited religion as the likely source of a negative impact. For those who see resettlement as a negative, the reasoning most frequently given is the cost of domestic aid and the over taxing of local resources. Those who see refugee resettlement in a positive light are generally more united on the topic; the most frequent opinion shared was that it would make Vermont a more culturally diverse area, and a better place to live. President Obama has promised asylum in the United States to 10,000 refugees, so far Vermont has been promised 100. Although only a fraction of the whole, a small homogeneous state like Vermont is easily affected. Vermont is.23 of a percent of the total population, yet they are accepting one percent of refugees. For the country as a whole, 10,000 is a small splash in the ocean, but Vermont is only a small pond and 100 people can make a big splash. No one knows what will happen in the coming months, but as Rutland County opens its arms to refugees the impact will become clearer. The VPR Poll in July 2016 asked Vermonters about the candidates. Respondents were asked if they have heard of each candidate for governor or lieutenant governor; for each candidate that a respondent has heard of, the respondents were asked if their opinion of that candidate was favorable or unfavorable. The data from these two questions allowed us to assess how well a candidate is known and whether those who know the candidate have a favorable or unfavorable opinion (or no opinion at all). This is what a campaign is all about: to introduce or reintroduce one’s candidate to the voters and to create a favorable image for that candidate among those voters. The successful campaigns approach the election with a large percentage of the public holding favorable views of their candidates. As the Vermont state primary approaches, the candidate with the greatest level of name recognition is current Lieutenant Governor and gubernatorial candidate Phil Scott. Of the 86 percent of Vermont adults who recognize Scott, 58 percent hold a favorable view of him, while only 13 percent hold an unfavorable view—giving Scott a net favorability score of 45. (Net favorability is percentage of respondents with an unfavorable opinion of the candidate subtracted from the percentage of respondents with a favorable opinion; those with no opinion are not included in the calculation.) The only gubernatorial candidate with a higher net favorability score—higher by a mere and insignificant 1 point—was Sue Minter; however, only 63 percent of Vermont adults have heard of Minter. 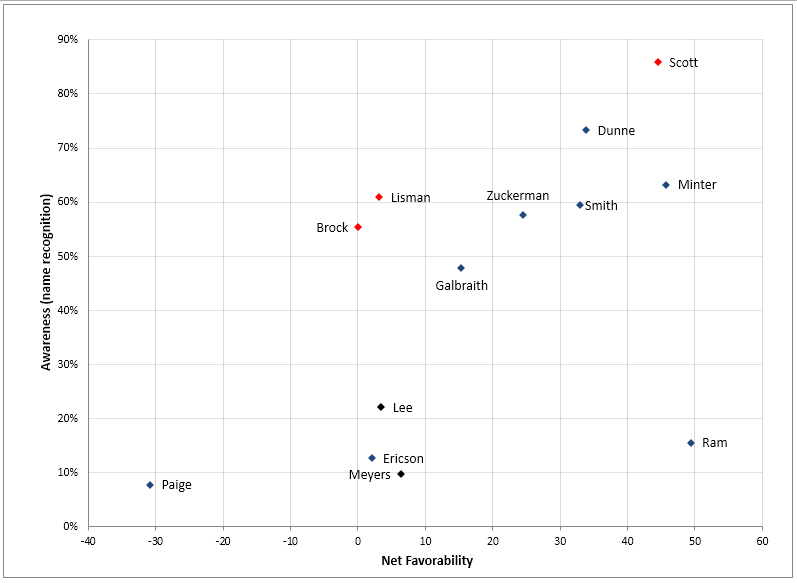 The following graph shows the relative awareness and net favorability for all of the candidates for governor and lieutenant governor. Of course, the job of a campaign is to improve the level of public awareness and public approval for one’s candidate. In September 2015, the Castleton Poll asked Vermonters about a number of candidate who were potentially running for governor. 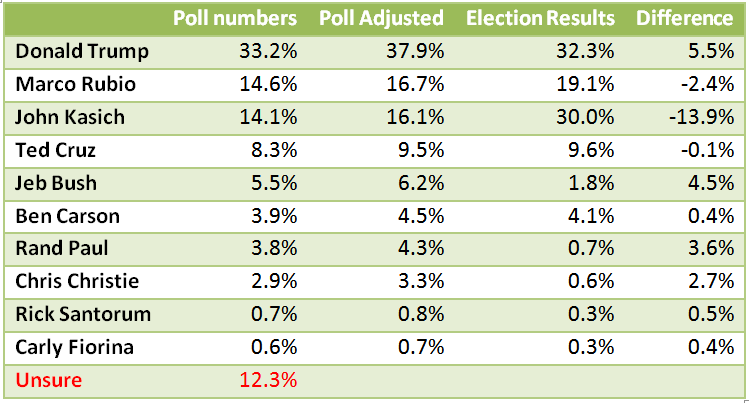 The following table shows the changes from fall of 2015 to July 2016. The campaign of Bruce Lisman made the most traction in getting the candidate’s name recognized by potential voters, going from having only 21 percent knowing who he is in September to 61 percent this July. Unfortunately, being known as a candidate takes a hit on one’s favorability ratings, as LIsman’s net favorability dropped from 13 to 3. This is what hit Phil Scott, who had the biggest drop in net favorability from September 2015 to July 2016. Of course, Scott had such high favorables it was inevitable that, as a candidate, those numbers would come down. Randy Brock, a former gubernatorial candidate, has lost ground running for lieutenant governor in both awareness and favorability. Sue Minter has made the greatest gains in favorability, picking up a net 20 points and increasing her awareness by 25 percentage points. While she is, in July 2016, a little less known than her primary opponent Matt Dunne, her net favorability is comparably higher. This sets up a potentially close race for the Democratic nomination. The victor will likely be the one who mobilizes supporters best with the better get-out-the-vote effort. A NBC News/SurveyMonkey Weekly Election Tracking Poll (May 3- – June 5, 2016) believe that the nominating process is fair; only 38 percent of Democrats label the process as unfair. This doesn’t mean that the Sanders supporters who are upset with the process may come around, but the majority of Democrats are not upset. What is interesting is that despite the fact that the outsider on the Republican side (Trump) seems to have prevailed, in contrast to the outsider on the Democratic side, the level of Republicans who say that the process for choosing a nominee in their party is unfair is equal to that of the Democrats, at 38 percent. I do not have the raw data, or I would explore who is upset on the GOP side. Are they supporters of an unsuccessful candidate, or are there a number of Donald Trump supporters who still believe the system is unfair despite their having prevailed? When Trump attacked his political opponents, both within and outside of his party, with demeaning nick names (e.g. “Little Marco” or “Lying Ted”), it seemed sophomoric and unbecoming of any individual seeking the presidency, but it did not raise constitutional questions nor did it seem to threaten the fabric of American democracy, in my mind. However, when Trump questioned the integrity of U.S. District Judge Gonzalo Curiel, the context of Trump’s attacks changed from merely political to potentially threatening to the Constitutional balance among the three branches of government. There is a reason that lawyers can face sanctions for raising unfounded recusal arguments; frivolous recusal requests undermine the system of justice. Imagine if these came from President Donald Trump. To get an idea of the questions that would be raised, simply recall the reaction to President Obama’s derision of the Citizens United ruling during a State of the Union address, and consider that he did not make any charges about the motives or integrity of the justices. The public’s low confidence in the media makes Trump’s hostility to the press easier to understand. And yet the press has repaid Trump’s hostility with a wealth of earned (free or nonpaid) media coverage. According to the New York Times (March 15, 2016), Trump had received over $1.8 billion in earned media by that point in the campaign, eclipsing all other candidates by far. In fact, the second highest level of earned media went to Hillary Clinton, $746 million, or less than 40 percent of what Trump received. The days of chumming with the press like John F. Kennedy did are long gone, and this has been to the electorate’s advantage. It would not surprise me to learn that most candidates carry disdain for the press, but candidates, as a rule, do not behave in an openly hostile manner to the press. Most candidates understand that the press—the fourth estate—is necessary to keep the public informed, to be a watchdog for public interests, and to provide voters with the information they need to make intelligent decisions in the voting booth. At the 2016 New England Political Science annual conference in Newport, RI, in April, Matthew MacWilliams from UMass Amherst presented his research in a presentation titled, “The Rise of Donald Trump: America’s Authoritarian Spring.” The provocative title drew political scientists into the panel like moths to a light on a summer’s night, and the presentation did not disappoint. MacWilliams, who is the President of his own political consulting firm called MacWilliams Sanders Communication, used survey data to measure respondents’ support for authoritarianism in a multivariate scale. Among the measures used in the scale are support for suspending habeas corpus, support for “keeping other groups in their place,” and preventing minority opposition. Those who scored highest on the authoritarianism scale were more likely to support Trump than those who scored low. So, those who say a Trump presidency “can’t happen here” should check their conventional wisdom at the door. The candidate has confounded conventional expectations this primary season because those expectations are based on an oversimplified caricature of the electorate in general and his supporters in particular. Conditions are ripe for an authoritarian leader to emerge. Trump is seizing the opportunity. And the institutions—from the Republican Party to the press—that are supposed to guard against what James Madison called “the infection of violent passions” among the people have either been cowed by Trump’s bluster or are asleep on the job. On February 22, 2016, Vermont Public Radio released the results of a statewide presidential primary and issues poll conducted by us, the Castleton Polling Institute. The poll came out of the field on February 17 in order to weight the data and give VPR reporters time to prepare stories putting the polling results in context, and VPR wanted to use that time to reflect on where Vermonters stood in advance of 2016 Town Meeting Day and a presidential primary that was to feature a US Senator from Vermont in the Democratic primary and a topsy-turvy Republican race. Since the election, I have taken some time to reflect on the poll and how well it reflected the public’s primary preferences; I’m conducting a review of our polling to assess to what extent we had a clear picture of the Vermont likely voters 12 days prior to the presidential primary and whether or not our likely voter model needs an overhaul. We used the 2008 presidential primaries as a basis for estimating voter turnout in 2016, since 2008 is the most recent election where no incumbent (neither president nor vice-president) was seeking the nomination in either party. In addition, we made a presumption that the Sanders’ campaign had created an excitement among younger voters akin to the 2008 Obama campaign. Our poll reinforced these assumptions, showing a high degree of support for Sanders among younger voters and showing that the percentage of votes cast in the Democratic primary would near (but not reach) the level of 2008. Sixty-six percent of poll respondents said that they would take a Democratic ballot, and 22 percent said that they would take a Republican ballot in the open primary; when we adjust for 11 percent that hadn’t yet decided in which primary they would vote (eliminating the 11 percent “unsure” and distributing that percent proportionately among the Democratic and Republican primaries) we had 75 percent in the Democratic primary and 25 percent in the Republican primary. The adjusted values overestimated the Democratic share of primary voters (69 percent) and underestimated the Republican share (31 percent) by 6 percentage points. It appears, given the volatility and excitement surrounding the Republican nomination race that the “unsure” voters gravitated more strongly to the Republican contest. In our likely voter estimation, 78 percent of the respondents planning to vote in the Democratic primary favored Sanders, in contrast to 13 percent for Clinton; 9 percent were unsure at the time, which is not an unreasonable stance two weeks prior to a primary election. Adjusting for the fact that voters do not cast “unsure” ballots, distributing the “unsure” voters proportionately results in 86 percent for Sanders and 14 percent for Clinton, estimates that perfectly reflect the actual share of the vote for the Democratic candidates. Given the volatility of the Republican race in the 12 days from when the VPR poll came out of the field until Vermonters cast their votes, it is not surprising that the estimates of where voters stood on February 17 did not mirror the final Republican vote tally. Using the same process of adjusting for the “unsure” voters (by distributing their votes among the candidates in proportion to the candidates’ share of the vote without “unsure” voters), our likely voter model had Donald Trump winning the Vermont Republican primary with 38 percent of the vote, nearly 6 percentage points higher than his actual share of the vote. The difference between where we had Trump and Rubio on February 17th and where they finished on March 1 is affected by a great deal of campaign dynamics, but the estimates were well within our poll’s sampling error for the subset of Republican voters (MoE = +/- 9 percentage points). Kasich’s final vote tally, however, fell outside of the margin of error; his final vote share was nearly 14 percentage points higher than where we had his estimate on February 17. The efforts that the Kasich campaign put into Vermont changed Kasich’s prospects after the poll was out of the field. By the time Vermonters cast their ballots the field had winnowed down to five active candidates; most of the Vermonters who supported Bush (5 percent), Christie (3 percent) and others (2 percent) sought out other candidates to support. Additionally, the 12 percent “unsure”—which we distributed proportionately to candidates based on their poll support—were not likely to go to the candidates who had suspended their campaigns. It is not inconceivable that some of the Bush and Christie support would go to the remaining governor in the race, John Kasich, but that would not explain all of Kasich’s gains. Between the conclusion of the poll and election day, Kasich was the only candidate to visit Vermont, not once but twice (February 27th and 29th), including a visit to the more densely Republican Rutland County. Given that Vermont is the size of a small congressional district (the average size being 710,767, about 14% bigger than the population of Vermont), it is possible to make measurable gains in a short time because a candidate can reach a large proportion of the voters without the effort and resources it would take in a larger state. Campaigns matter, and their activity can move voters. To believe otherwise, we could conduct a poll at the outset of candidate announcements and use those results to predict winners. But to do so would be a ridiculous proposition. In primary elections, voters cannot fall back on the decision shortcut of party preference, so candidates have more room to sway voters. The dynamics of the campaigns make it difficult to mirror election day results days before an election when voters have time to change or make up their minds. The VPR poll asked respondents if they were likely to change their minds before election day. 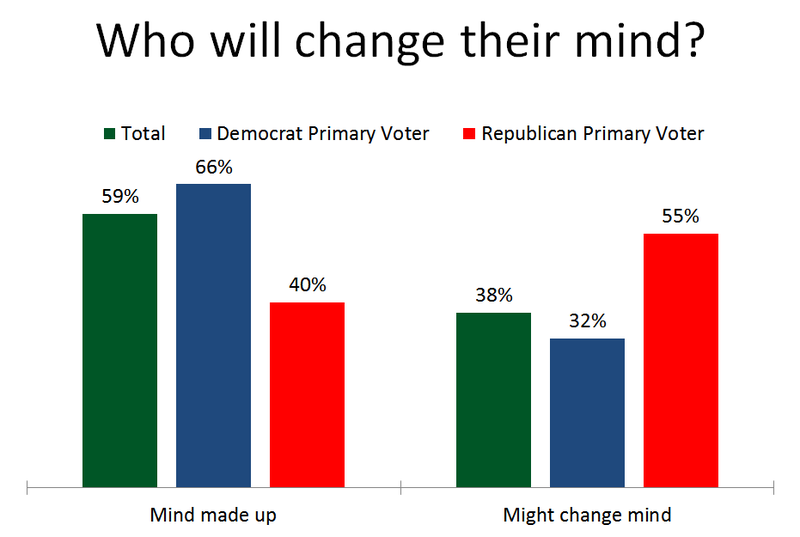 Overall, a majority (59 percent) said that their mind was made up, but among those planning to vote in the Republican primary, a majority (55 percent) said that they might change their mind, as illustrated in Figure 1. The odds are very high that many did in fact cast their ballot for someone other than the candidate they supported in the poll. In general, we believe that the VPR poll and the likely voter model employed did an effective job demonstrating public views at that time; in fact, those results mirrored the final outcome in the Democratic primary, where voters had mostly settled on their choices earlier than in the Republican primary. Differences between poll results and the ultimate election results in the Republican primary are easily attributed to the Kasich campaign efforts and the changing landscape in the Republican race in the aftermath of the South Carolina and Nevada primaries. On February 9, 2016, Project 240 (a collaboration between the Paramount Theatre and Castleton University), hosted a Mock Primary designed to coincide with the New Hampshire primary. Those in attendance were treated to a showing of the 1960 documentary Primary, including commentary and discussion by Castleton faculty Michael Talbott and Rich Clark, a discussion by Senator Pollina about the date of Vermont’s primary, a presentation of student-collected data about the political process gathered by Assistant Professor Jennifer Turchi’s Sociology Research Methods class, and an opportunity for everyone in attendance to cast a ballot in the Project 240 Mock Primary. A total of 89 votes were cast with 63 attendees selecting the Democratic ballot and 26 selecting the Republican ballot. Bernie Sanders won the Democratic vote. In a close race on the Republican side, John Kasich won the mock primary by one vote over Donald Trump. The next Project 240 event will be on February 28th with a fantastic evening of music. Two more primary debates are on the Project 240 schedule on March 9th and 10th. (For more information go to: http://project240.org/) We hope you’ll join us for these great community events as we make our way through the election season! Some diners settle on a menu item right away, knowing exactly what they want to eat, while others wait to make their decision when waiter starts taking orders. This is not new; it is human nature. Polls are a snapshot of public opinion as it exists when the calls are made. In fact, the typical horse-race question begins, “If the election were held today, who would you vote for …” asking the respondent not for whom they will eventually vote but for whom they would vote if the election were right now. Of course, pollsters add questions to measure the likelihood of one’s changing their mind, and we see in New Hampshire that the possible of changing one’s mind is rather high. But just as some who have an idea of what they want to eat may eventually order something different on a whim, it is likely that such behavior happens in the voting booth as well, although probably not in the majority of cases. Pollsters, political activists, and reporters work in a bubble where everyone around them is intensely focused on the upcoming campaign, but most Americans have only a fleeting interest in politics and do not spend much time assessing the options long before it is time to vote, despite our wishes that they did. This is far less common in general elections, where one as partisan identifications as cues for whom to support, than in primaries, where all of the candidates are of one party. The costs of acquiring adequate information about candidates is much higher in primaries than in general elections, thus one’s choice is far less pre-determined. All of this makes it very difficult to predict the outcome of a primary election, even with the best of polling. The difference between being a pollster and a pundit is that the former are actually held accountable for their pre-election assessments. What does it mean when the percentage of residents who disapprove of a governor’s job performance is higher than the percentage that approves? For one, it means that there is reason to question public support of the current administration. This could be due to a failure of policies or to an inability to shape the message reaching the public, but whatever the source, it weakens the administration’s ability to shape the public agenda. Overall, 40 percent of Vermonters approve of the job that Peter Shumlin is doing as Governor of Vermont, while 43 percent disapprove. As reported in our data release, those who follow news about Vermont most closely report the lowest levels of approval. This is relevant because attention to the news is often associated with likelihood to vote, and while Governor Shumlin will not be on the ballot in 2016, every election for an executive office is about the person currently holding that office. The 2016 gubernatorial race will be as much a referendum on the Shumlin administration as the presidential race will be about President Obama. For the 13 percent of respondents who see taxes and government spending as the most important issues facing Vermont today, only 34 percent approve of the Governor’s job performance while a majority (56 percent) disapprove. Additionally, for the 10 percent of Vermonters for whom healthcare is the most important issue, 36 percent approve and 53 percent disapprove of the Governor’s job performance. On the other hand, for those whom education, energy and environment, or drugs and opiate addition are the most important issues, the Governor’s approval ratings outpace his disapprovals. 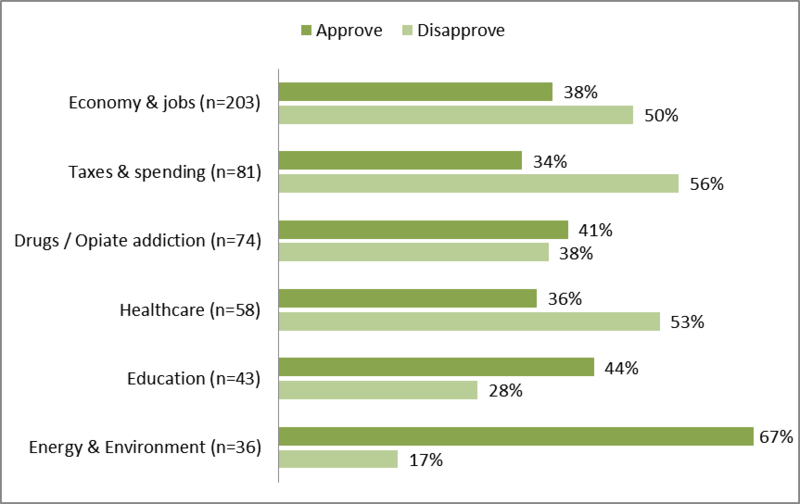 Lastly, half of those who see the jobs and the economy as the most important issue (33 percent) disapprove of the Governor’s job performance compared with the 38 percent of this group who approve. In other words, the Governor’s net approval rating is -12 percentage points among those who are focused on the economy. What is clear from the data is that approval of the Governor’s job performance is associated with public views on the direction of the state (Cramer’s V = 0.527 p<.001, see note 1 below). Those who approve of the Governor’s performance are far more likely to say that the state is heading in the right direction (62 percent) than those who do not approve (21 percent). 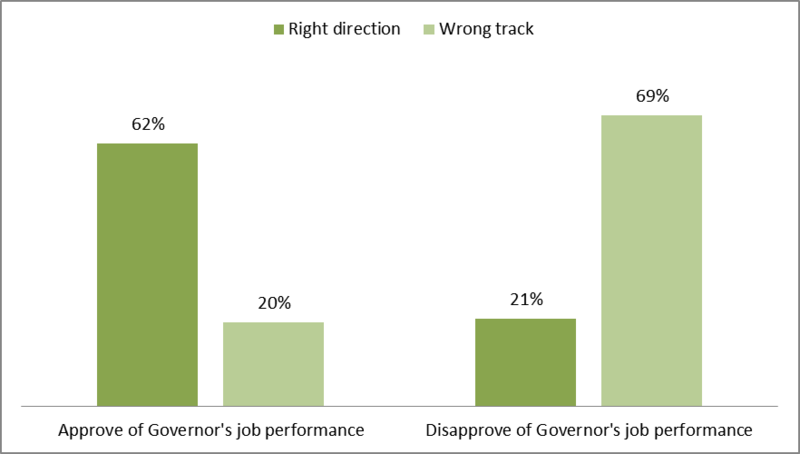 Conversely, those who disapprove of the Governor’s job performance are far more likely to say that the state is on the wrong track (69 percent) than are those who approve of Shumlin’s performance as governor (20 percent). 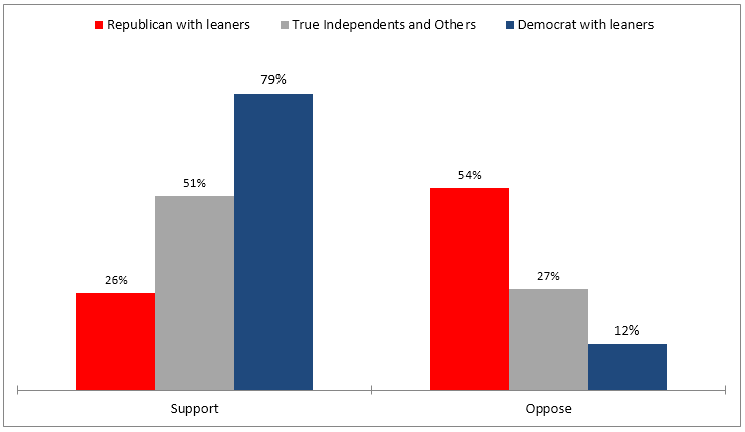 When we control for party affiliation, it is not surprising that the association is stronger among Republicans and Independents than among Democrats, although there is a statistically significant relationship between one’s assessment of the Governor and one’s assessment of the direction of the state regardless of party affiliation. What I think this all means for the 2016 gubernatorial election is that all candidates will work to separate themselves from the current administration and suggest that their election will take Vermont in a new direction. This is particularly tricky for whoever wins the Democratic nomination in that they need to avoid being cast as the continuation of the current regime in order to win over the votes of those who are displeased with the current direction of the state. Cramer’s V is calculated from a 2 x 2 table, excluding all “Don’t know” responses as missing data, unweighted n = 462. The degree of association was tested with both weighted and unweighted data, and the reported coefficient is the more conservative value (from the weighted data). The Cramer’s V coefficient from the unweighted data is .601. Did you get a call from us? The Castleton Polling Institute regularly calls Vermonters (and sometimes those outside of Vermont) seeking their thoughts and opinions about a variety of issues—including politics. We realize that when we call your houses and cellphones that we interrupt your daily routine, but we hope you will spend a few short minutes and talk to us. Our goal is to gain unbiased, non-partisan insight into the thoughts and opinions of the public. Castleton Polling Institute doesn’t have an agenda, other than learning from you. We only undertake studies on behalf of academics, non-partisan media, government organizations, citizens and businesses. If we think a study is being conducted as a push-poll (Push Poll Definition AAPOR) or just to support one particular candidate or cause, we won’t conduct it. If you get contacted by us, we hope that you’ll participate in our study. We truly value your time and your opinions. In an era of divisive politics, Project 240 aims to provide a positive space where the community can come together to explore election issues, instead of be divided. For its part of the project, the Castleton Polling Institute will provide insight on the sure to be dizzying array of public opinion data available in the media. Additionally, we’ll present our own polling data to help share Vermonters’ opinions about the election. Project 240 is an unprecedented, ambitious community effort. Whether or not you are interested in politics, the events are sure to be an entertaining and fun way to connect with your neighbors and the Rutland community. The first event is on September 16, 2015–come out and join us!